The state of South Carolina has many official state symbols, holidays and designations and they have been selected to represent the history, resources, and possibilities of the state. The palmetto and crescent moon of the state flag is South Carolina's best-known symbol. It is seen on shirts and bumperstickers and is often adapted throughout the state to show support for collegiate teams or interest in particular sports activities. The state has several symbols that represent its sovereignty and from where it was gained. The state House of Representatives has used a ceremonial mace since 1880. When the House is in session, the mace is placed in a specially designed rack in front of the Speaker of the House. The state Senate uses a sword of state. The current sword of state was a gift from Lord Halifax, a former British ambassador to the United States, and has been in use since 1951. The original sword of state was obtained in 1704 and used by the governor of the South Carolina Colony. The state flag originated to represent the militia that fought for independence in 1776. The Seal of South Carolina was adopted in 1776. The seals of the Senate and House incorporate the sword of state and the mace respectively. State craft: sweetgrass basket weaving – Sweetgrass (Muhlenbergia filipes), being native to the coastal dunes of the Carolinas, provided the perfect material for African slaves to utilize their traditional skills and produce a tightly-woven coiled basket. This handcraft has been passed down through generations and a high concentration of basket weavers is still found near Mount Pleasant. To this day, the form of the sweetgrass baskets woven in South Carolina closely resemble their African counterparts. State dog: Boykin Spaniel – The Boykin Spaniel was first bred in South Carolina near Spartanburg.It is a small dog with an often brown,corly coat and golden eyes.It was bred primarily for waterfowl hunting.The breed's popularity outside of the state is rising. The dog is known for its jovial personality and energy. It is also known as the " swamp poodle" and " the little brown dog." State flower: yellow jessamine (Gelsemium sempervirens) – The return of yellow jessamine each spring is thought to suggest the lesson of "constancy in, loyalty to and patriotism in the service of the State." It is very common and seen throughout the state. State wildflower: goldenrod (Solidago altissima) – With a long bloom time and long lasting flowers, goldenrod was selected as the "official state wildflower". Dum spiro spero (While I breathe, I hope).It appears on one of the state's license plates. State snack: boiled peanuts – Boiled peanuts are a popular snack food in the Southern U.S.
"South Carolina On My Mind" (1984) – Both state songs were written by South Carolinians. State tree: sabal palmetto (Sabal palmetto) – The palmetto has been a symbol for South Carolina since the American Revolutionary War when it was used to build a fort on Sullivan's Island that withstood British attack. The palmetto tree appears on the first symbol of the state, the seal created in 1777. It was officially named the state tree in 1939. (1939). It is a very popular state symbol . the tenth day of May--Confederate Memorial Day, It is a very controversial in the modern era. the twenty-fourth, twenty-fifth, and twenty-sixth days of December. South Carolina observes numerous special days and weeks throughout the year. The month of February is American History Month, created for appropriate observances of American history. Purple Heart Day is the third Saturday in February to honor the Purple Heart medal and the men and women awarded it. March 18, John C. Calhoun's birthday is South Carolina Day when the history, resources and possibilities of the state are to be taught in schools. The last week in April in each year is designated as Golf Week. It commemorates the economic impact of the golf industry, the importance of the state's junior golfers and the importance of turfgrass research. May 1 is Loyalty Day. The first Friday in May is Vietnam Veterans Survivors' and Remembrance Day. The Friday preceding Mother's Day is designated Family Respect Day to "recognize the role the family unit plays in a healthy and productive society." The state observes the second Sunday in May as Mother's Day. The first week of June is South Carolina State Guard Week. June 28 is Carolina Day to remember the anniversary of the Battle of Fort Sullivan in 1776. Garden Week is the week beginning the first Sunday of June. The last week in August is Family Week. The South Carolina Family of the Year is awarded during this week. September 11 is a State Day of Remembrance for the victims of the tragic events of the September 11, 2001 attacks, and for the firefighters, law enforcement, National Guard, emergency service personnel, and 911 telecommunicators who risk their lives and contribute every day to ensure the safety of the state's citizens. The third Friday in September is POW/MIA Recognition Day in South Carolina observed to remember military personnel who were prisoners of war or declared missing in action. October 11 is set as General Pulaski Memorial Day to commemorate the date of Casimir Pulaski's death and remember his service in South Carolina during the American Revolution. The fourth Friday in October is Frances Willard Day to educate children on the evils of intemperance. The week which includes November 11, Veterans Day, is designated as Patriotism Week to recognize contributions made by military veterans to American society, to honor the supreme sacrifices made in defending the freedoms and protections afforded by the United States Constitution, and to memorialize those who lost their lives in military service. The first Friday of December of each year is Arbor Day in this state, encouraged to be observed by the planting of trees on school property. December 15, the anniversary of the ratification of the Bill of Rights of the United States Constitution, is Bill of Rights Day in South Carolina to recognize the meaning and importance of each of the ten constitutional amendments. The pledge to the flag of South Carolina is "I salute the flag of South Carolina and pledge to the Palmetto State love, loyalty and faith." The South Carolina Botanical Garden at Clemson University is designated the state botanical garden. The South Carolina Tobacco Museum in Mullins is the official tobacco museum. The South Carolina Railroad Museum in Winnsboro is the official railroad museum. Camden Military Academy is designated as the official military academy. The South Carolina Hall of Fame located in the Myrtle Beach Convention Center, is the official state hall of fame. The South Carolina Artisans Center, in Walterboro, is the official folk art and crafts center of the state of South Carolina. In 2001, the Abbeville Opera House received the designation of the official state rural drama theater. 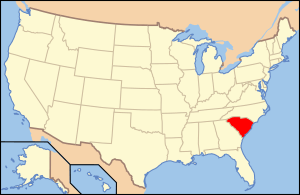 List of South Carolina state symbols Facts for Kids. Kiddle Encyclopedia.